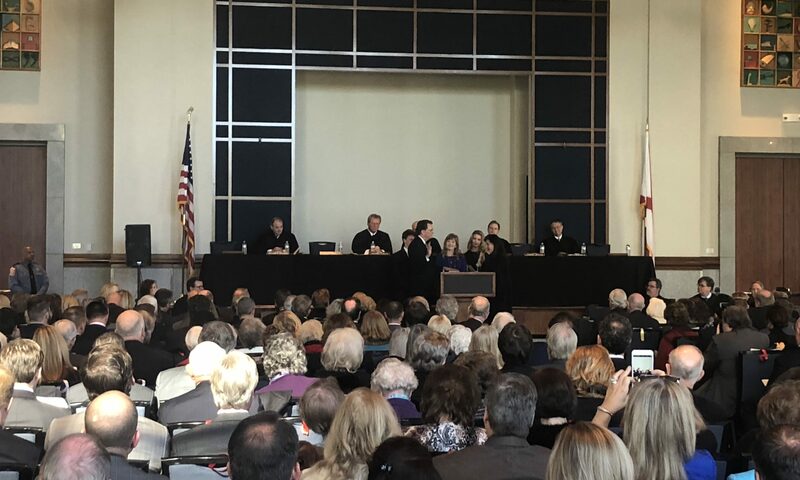 Friday, Tom Parker was sworn in as the Chief Justice of the Alabama Supreme Court at an investiture ceremony in Montgomery. The new associate justices, as well as the new members of both the Court of Criminal Appeals and the Court of Civil Appeals, were also sworn in at the same event. Associate Justice Mike Bolin is now the senior Associate Justice and presided over the beginning of the investiture ceremony. The Chief Justice said that the courts must have sufficient administrative personnel for the courts to function and for the security of the courts to be maintained. Parker made several quotations from the Bible including: “Of the increase of his government and peace there shall be no end, upon the throne of David, and upon his kingdom, to order it, and to establish it with judgment and with justice from henceforth even for ever. The zeal of the LORD of hosts will perform this.” (Isaiah 9:7 KJV) and “I walk in the way of righteousness, along the paths of justice,” (Proverbs 8:20 NISV). Once sworn in as Chief Justice, Parker took over as the presiding officer at the investiture ceremony. Associate Justice Tommy Elias Bryan was sworn in next. Associate Justice Kelli Wise administered the oath office to Bryan. “I grew up on a small family farm outside of Brantley,” Justice Tommy Bryan said. It is m y hope that my life experience as a child, as a son, as a student, as a husband, as a father as a lawyer, and a believer will prepare me temper justice with mercy. Court of Civil Appeals Judge Scott Donaldson administered the oath of office to Associate Justice Sarah Hicks Stewart. James “Jay” Mitchell’s oath of office was administered by Associate Justice Mike Bolin. Greg Shaw, Michael F. Bolin, A. Kelli Wise, Will Sellers, and Brady E. “Brad” Mendheim Jr. are also returning as Associate Justices on the Alabama Supreme Court. Pastor Chris Hodges of the Church of the Highlands said it is great to be here today and it is an honor to be part of a state that begins and ends an event such as this with prayer. The oath of office to Jay Chris McCool was administered by federal District Judge Lyles Burke. McCool was sworn in to the Alabama Court of Criminal Appeals. The oath of office was administered by Associate Justice Michael A. Bolin to James William “Bill” Cole. Bill Cole was sworn in as a judge on the Alabama Court of Criminal Appeals. The oath of office was administered to Richard J. Minor by federal Appeals Court Judge William H. “Bill” Pryor. Richard Minor will serve on the Alabama Court of Criminal Appeals. The oath of office was administered to Christy Olinger Edwards by Associate Justice Tommy Bryan. Edwards serves as a judge on the Alabama Court of Civil Appeals. “I never promised you I was perfect, but I promised you that I would always be fair and that I would follow the law as written,” Judge Edwards said. The oath of office to Chad Arthur Hanson was administered by Court of Civil Appeals Presiding Judge William C. Thompson. Judge Hanson serves on the Alabama Court of Civil Appeals. Alabama is a very Republican state and all of the members of the Alabama Supreme Court, the Alabama Court of Criminal Appeals, and Court of Civil Appeals are Republicans. Alabama Governor Kay Ivey, Lieutenant Governor Will Ainsworth, Attorney General Steve Marshall, state Auditor Jim Zeigler and the other statewide constitutional officers will be sworn in to four year terms on Monday at 10:00 a.m. in front of the Alabama State Capital building.